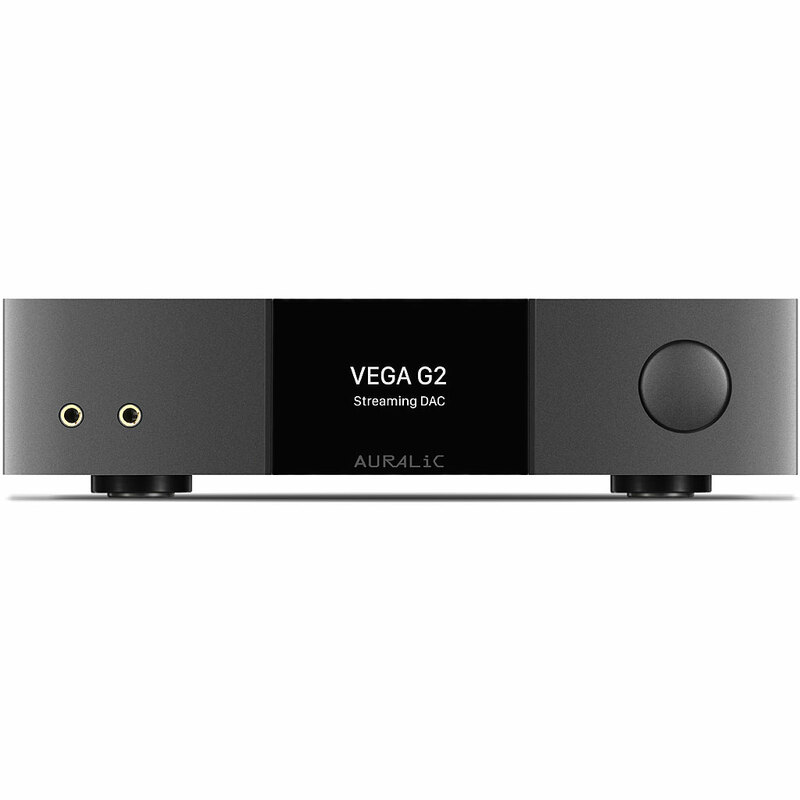 The Auralic VEGA G2 Streaming DAC is the next generation of the company's successful Vega DAC. Accepting music up through DSD512 and PCM 32/384 kHz, the G2 is a much different product than previous versions. This streaming DAC is literally a newly designed VEGA DAC and newly designed ARIES in a single chassis. The VEGA G2, like the ARIES G2, is built on Auralic's Tesla hardware platform and LIghtning streaming infrastructure. For the first time in the audio industry, it’s a DAC that operates independently of the source signal’s frequency: VEGA G2 buffers data in such a way that it has no need to lock on to the frequency of its source signal. Never before has a DAC been able to entirely govern timing with its own clocking. The VEGA G2 features dual 72 femto master clocks in this industry-first design approach. Unlike the ARIES G2, the VEGA G2's clocks each handle a sample rate family. One handles sample rates in multiples of 44.1 while the other multiples of 48 kHz. These are 72 femtosecond clocks, that's 72 quadrillionths of a second. They have -169dBc/Hz of phase noise and a 100 Hz offset noise level of only -118dBc/Hz. The Tesla platform for the VEGA G2 includes an ARM Quad-Core A9 chip, 1GB DDR3 RAM and 4GB of storage. The new processor is capable of calculation speeds 25 times faster than the original VEGA series. Why does this matter? A faster processor enables Auralic to use much more sophisticated DSP, filtering algorithms and oversampling / upsamping techniques than in all previous VEGA DACs. Many people today are using external PCs to do upsampling and filtering because their DACs don't have the power or ability to run specialized DSP algorithms. The VEGA G2 should be a product that will enable consumers to seek a middle ground between super powerful external PCs capable of extremely complicated filtering and resampling and more traditional DACs with much less capabilities because of hardware limitations. The VEGA G2's powerful hardware enables what Auralic calls flexible filter mode. This is the next generation filter mode with four user selectable filters. The names of the modes are recognizable to existing Auralic customers, "Precise Mode maximizes in-band ripple and out-band attenuation performance for example, while Smooth Mode eliminates pre-ringing. Dynamic and Balance Modes round out the available options that provide an extra level of control for your listening." Similar to the ARIES G2, the VEGA G2 also has similar galvanic isolation and dual low noise linear purer-power supplies." Lightning Link is a low-jitter, bi-directional 18Gbps coupling that takes advantage of highspeed HDMI-type hardware connectors to provide a superior level of transmission control,making today’s ultra-high resolution digital music shine like never before. Different from the I2S standard, the bi-directional Lightning Link opens the door to jitter-free operation of all the devices in your system. Clocking information from destination devices such as the VEGA G2 can drive the ARIES G2 timing for example, providing perfect data synchronization. Lightning Link also carries system control data for everything from volume control to processor engine setup, allowing all linked AURALiC devices to appear in a single, unified control interface. We’ve built the VEGA G2 with two incredibly precise clocks for amazing accuracy. One clock handles sampling of formats in multiples of 44.1kHz, and the second takes care of 48kHz (and multiples) files. They’re the most sophisticated clocks we’ve ever built, and function on 72 femtosecond cycles – 72 quadrillionths of a second. The result is less jitter and immaculate sound. The 72fs Femto Master Clock is just as quiet as it is accurate, with an extremely low -169dBc/ Hz of phase noise and a 100Hz offset noise level of only -118dBc/Hz, thanks in part to its lownoise 3uV dedicated power supply. The union of AURALiC’s Lightning OS, the Tesla Platform and our 72fs Femto Master Clock leads to a new trick hiding up the VEGA G2’s sleeve: it’s a DAC that’s always in charge. While DACs until now have relied on DPLL circuitry to lock on to the input signal’s frequency, the VEGA G2 has no such limitation – a first in the audio industry. Lightning OS takes full advantage of the Tesla Platform’s considerable resources by buffering enough data to make the input signal’s frequency irrelevant, allowing the VEGA G2 to govern all processing with that super-accurate 72fs Femto Master Clock. It’s a configurable setting too, from 0.1s to 1s, so a smaller buffer size may be set for higher quality sources. Inspired by the classic Neve 8078 analog console circuit design, the ORFEO Class-A Output Module found in the VEGA G2 is capable of driving various loads, matching the characteristics of different power amplifiers. ORFEO uses small signal components with excellent linear characteristics, thermally balanced and biased into Class-A to achieve open loop distortion of less than 0.001%. In the VEGA G2, ORFEO has been optimized for lower noise while maintaining the ability to drive 600ohm loads without increasing distortion. AURALiC’s Purer-Power technology already re-examined every detail of power delivery with innovative wiring and circuit designs based on the concepts of isolation and purification. The ARIES G2 takes that approach a step further by including two internal Purer-Power linear power supplies, separating and protecting distinct power circuits from interference. The first Purer-Power supply feeds the VEGA G2’s processing circuit, LCD display, and network interface. 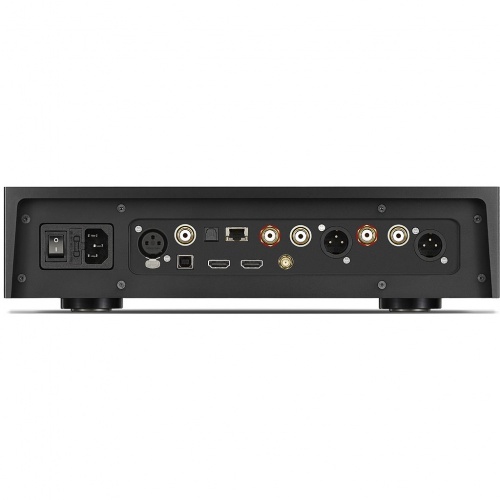 The second Purer-Power pathway is dedicated to sensitive audio components such as the D/A converter, the Femto clock, and the analog circuit. Both power supplies are galvanically isolated from each other to ensure zero EMI interference between them. The 2nd generation of AURALiC’s Flexible Filter Mode makes an appearance in the VEGA G2 for a nuanced level of user-selected control over audio output. It includes four filter modes developed using a combination of objective data models and subjective testing, with each mode assembling a unique array of filters to match the sonic qualities of the source. Precise Mode maximizes in-band ripple and out-band attenuation performance for example, while Smooth Mode eliminates pre-ringing. Dynamic and Balance Modes round out the available options that provide an extra level of control for your listening.